Oh I could tell you stories about how Rose trained! She is an inspiration!!! I’m honored to call her a teammate!!! Today we begin a new series that looks at “Outside The Box” training methods. These are methods that venture outside-the-norm for swimming. Each month, we’ll interview a swimmer or coach about their individual experiences with some unusual training techniques. As always, some of these training techniques are not intended for everyone and should be conducted under a safe environment with supervision. 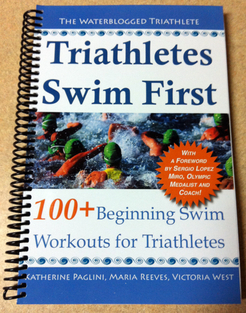 If you have unusual training techniques to share, please email me at swimmingstories@gmail.com. Last weekend at the Open Water Nationals, we saw an abundance of the toughest, fittest, strongest swimmers on Earth. To swim a 10k requires not only peak physical condition of an Olympic athlete, but also the mental strength of a Buddhist Monk. Isolated, alone, engulfed with cloudy waters for hours on end, open water swimming is not for everyone. These athletes are not made on race day. They are chiseled and honed through years of grueling and exhausting preparation. Erica Rose knows preparation. World champion in the 5k by age 15, Rose has been one of the most dominant open water marathon swimmers in the past fifteen years. She has competed in numerous 25k+ marathon swims throughout her career, and recently won the Manhattan Island Swim around New York City (47k!) back in 2011. Rose cites one particular and very unusual training technique while swimming at Northwestern University under head coach Bob Groseth. The purpose of such an exercise was to keep Rose horizontal (without flip turns) for extended periods of time. Races like the 10k, the 25k, or even longer require the body to be horizontal. Through this, Rose became so in-tune with her body that, after a while, she would know her tempo without even looking at a clock. She had found an exact stroke count ideal for her marathon swims, so that any variance in tempo meant something was wrong. Rose explains that not all of the exercise was purely for its physical benefits. Being strapped to a tether every Saturday morning for hours on end is also a mental exercise. It trains the mind to be OK in situations of extreme isolation and boredom. Occasionally Rose would strategically change her stroke count during workout, creating “sets” of 10 minutes where she would purposefully increase her stroke count to 90 or 95 strokes per minute. She became so used to the tether technique that she would bring the tether to international races and warm-up with it for 10 or 15 minutes the day before, just to make sure her stroke rate was on. (She explained that this could only happen if the pool had a starting block.) She would use the tether then swim a few laps in the pool. Rose explained that swimming on a tether for four hours once a week is the equivalent to running a marathon on a treadmill. Because of that, Rose also notes that this type of training is not for everyone, or even for swimmers who don’t swim longer distances than the mile. But Rose did state that, for her, the training was incredibly effective. The above article was written about Erica Rose, a college teammate and open water World Champion, by another of our college teammates, Mike Gustafson, who is freelance writer and correspondent for USA Swimming. I asked permission to share it on our blog because it is relevant to triathletes and open water swimmers who want to simulate open water training in a pool. I like this article. Seen plenty of “stack” sets where swimmers are tethered to a “set resistance” but this has generally only been for 25-50m during strength sets. It’s great to do the odd “horrible” session in prep for specific sets…. i.e. I recently did a bike training ride in race kit when it was freezing and wet. Close to hypothermic afterwards but in my race a week later, I felt really prepared for the cold water! Thanks! It is a good article. Erica is a very hard worker and she just thrived on workouts such as these. Are you talking about a power rack when you mention “stack” sets? Your bike ride sounds like it was really challenging, but it definitely did the job!